I am making “Soles with an Edge” for students in two workshops right now, here’s a photo of boots made last year by instructor Carin Engen. 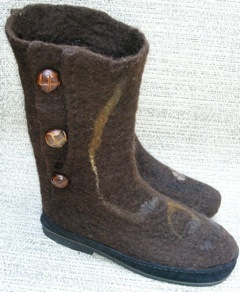 I love providing this soling, because these beautiful boots were worn outside all last winter! No more little circles of suede as soling! Of course the felt boots are exceedingly warm, but the natural rubber soling adds to their warmth by being so flexible..when your foot muscles are involved in walking, they stay warm. Another opportunity to have our own creativity and skills expressed wherever we go..